To achieve in life you must have the right mindset, the right approach and have the confidence to succeed. It’s so easy to talk the talk but it requires effort, dedication and some guidance to walk the walk and succeed. We can make up all the excuses we want in life, but if you want results we have to put in the time. I used to work in a supermarket when I was a teenager, and I can remember I had the task to look after a particular section. This section was my responsibility, keep shelves filled and rotate the stock so the sell by dates were in the appropriate order. Also with stock takes, checking the chillers and freezers making sure everything tallied up with the order books. This was a challenging task especially around busy periods like Christmas. Sometimes things were not quite so and we used to make our excuses to the line manager, Mr Finch. He’s favourite line was “I don’t want excuses I want results”, so much so it used to be a bit of a standing joke amongst staff. This line has always stuck with me, we can all make excuses for why we couldn’t achieve something, but with some grit, self-belief and willpower anything is possible. I eventually got the hang of stock takes! Ask yourself the question: If you are not successful the first time would you try to succeed again? If you want it badly enough then you will. Don’t be afraid of failure. Losing should not be seen as failure but an educational lesson to succeed. We must learn from our mistakes to achieve success. Sally a proud guest of our July Revive Health Fitness week. 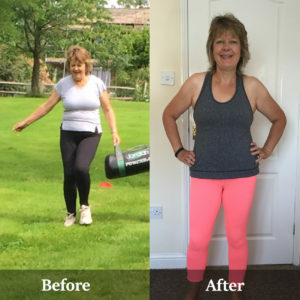 Sally had tried in the past to improve her health and wellbeing, and was unable to succeed. Sally was lost but had the courage and the mindset to try again. Sally developed a winning mentality and with guidance has accomplished success. Sally feels years younger with a new zest for life and is truly an inspiration to us all. “To lead and inspire we must first follow an inspiring lead”. There is always going to be leaders and followers in life, followers that want to succeed. Sally followed our lead and with it has inspired others to believe it is truly possible to succeed.